Explore the city by driving round the Civic District, passing by the Padang, Cricket Club, historic Parliament House and the National Gallery Singapore. The Gallery consists of two national monuments – the former Supreme Court Building and the City Hall. Make a photo stop here and view these magnificent buildings up close (weather permitting). Visit Thian Hock Keng Temple, one of Singapore’s oldest Buddhist-Taoist temples, before driving past Chinatown. Proceed to Singapore’s first UNESCO World Heritage Site - the Singapore Botanic Gardens and walk through the National Orchid Garden which boasts a sprawling display of 60,000 orchid plants. Leave the city behind as we head north to Mandai and visit one of the world’s top and most beautiful zoos. The Singapore Zoo is spread over 28 hectares and is a haven to over 3,600 mammals, birds and reptiles including some rare and endangered species. Natural barriers like streams, rock walls and beautiful landscaping are used to separate the animals from visitors thus creating an “open zoo” effect. Come and experience a close brush with nature from the comfort of your Tram or on foot. Catch a Cable Car ride from Mount Faber to the State of FUN – SENTOSA! The 8 seater cabins will give you a birds eye view of the Singapore Skyline. Enter a world of colors at the Butterfly Park & Insect Kingdom and allow 1,500 live butterflies from over 50 species to flutter about you. Join Sean and the stars of Journey to the Centre of the Earth, as they embark on a one-of-a-kin adventure in journey 2 – The Mysterious Island The 4D Adventure. Make a grand entrance into the larger-than-life icon – the legendary Merlion is a half lion half fish guardian of prosperity, which personifies Singapore’s history as a port city. Legend has it that the Merlion would visit Sentosa Island every year to guard Singapore’s well-being. Discover the awe-inspiring world of life in the ocean at SEA Aquarium™, the world’s largest aquarium. Explore more than 800 species of marine animals such as majestic manta rays and over 200 sharks through the world’s largest window to the ocean. Home to 5,000 birds of 400 species, Jurong Bird Park spans 20.2 hectares of lush greenery within Singapore’s model industry estate. 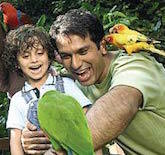 Visit 1,000 colourful lories and have a chance to feed them at the Lory Loft - the world’s largest Lory Flight Aviary. Take a ride on the Tram to visit the African Waterfall Aviary. Enjoy the spectacular Penguin Expedition and High Flyer Show at the Pools Amphitheatre. 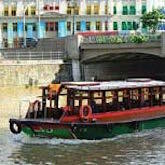 Our tour starts at The Singapore River - the lifeline of Singapore where our first immigrants eked out a meagre living and saw Singapore transform from an obscure little fishing village to a great seaport. Admire beautifully restored warehouses that now house chic quayside dining and entertainment spots and the contrasting skyscrapers of the Financial District. Then marvel at magnificent colonial buildings and five grand old bridges before stopping at our destination, The Fullerton Hotel Singapore. Enjoy a delightful three-tier Afternoon Tea served at the sun-lit Courtyard with its magnificent high glass ceiling. Favourite items are replenishable and complemented by free-flow of premium teas and coffee. Walk it all off at The Fullerton Heritage Gallery or mail a postcard home through the colonial-style Red Pillar Post Box located at the gallery. Let our guide take you back in time from when it was a Fortress built at the mouth of the Singapore River to the first General Post Office in the early 20th century and now the beautifully restored Fullerton Hotel, Singapore’s 71st National Monument. The world’s first Night Safari*, set in 40 hectares of secondary jungle, will unfold the mystery and drama of the tropical jungle after dusk with stunning effects. See a myriad of nocturnal animals, from fierce predators to timid forest dwellers, in their natural habitat under subtle moonglow lighting. With priority boarding, you won’t have to wait in line to board the tram which takes you through the East and West Loop. Pass by a large reservoir and weave through selected habitats designed specifically to replicate the natural environment from the Himalayan Foothills to the Southeast Asian Rainforest and Indian Subcontinent. 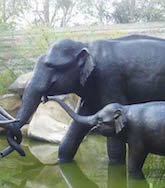 Let the guide take you on a walking trail to view some animals at close quarters. 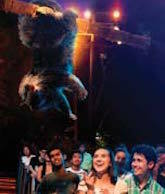 There will also be an opportunity to catch either the Thumbuakar performance of fire-eating skills OR a 20mins animal extravaganza at the Creatures of the Night Show, subject to weather conditions. We offer pick up services from major hotels. At the end of the tour, we offer a drop-off service, unless otherwise specified, to a point near your hotel, not necessarily at the hotel’s doorstep. Pick up begins 30 minutes prior to tour starting time and we recommend you be ready 5 minutes before given time. All tours are fully escorted by professional tour guides and are operated on a free seating basis in a luxury air-conditioned coaches or mini buses. 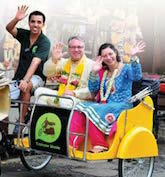 The contents of the various tours are current, services nd itineraries described are subjected to change or withdrawal. Depending on traffic conditions, durations of tour may vary. All prices are inclusive of current 7% GST. Every person participating in the tour/s shall be regarded in every aspect as carrying own risks with regards to loss or injury, to person or property. We do not accept responsibility for losses or expenses incurred due to delay, sickness, weather, strikes, war or other causes. Such losses and expenses being the responsibility of the traveller. Child prices applies for 3 to 12 years old inclusive, unless otherwise stated. Tour/s arrangements is confirmed ONLY with FULL PAYMENT received, via credit card payment. Any cancellation made WITHOUT PRIOR 48 hours notice are subjected to FULL CHARGE based on tour requests confirmed from our end. No Show are subjected to FULL CHARGE based on tour requests confirmed from our end. Separate names with comma (,).